So recently I met a German guy at the airport and we had a discussion on current politics and the uncertainties facing us. He, I like to call him “Dr. Doom”, told me that he was “investing” a major part of his savings into physical gold, because the Euro “couldn’t be trusted anymore”. I kept most of my thoughts to myself on this, but came back to the same question for days and days: Why are so many people jumping on the gold train right now? Who would have guessed? What began in 1843 with a gold and silver separation factory in Frankfurt founded by one Friedrich Ernst Roessler, would become Europe’s biggest gold retailer. I am talking of course about the German Degussa Gold. With interest rates at historic lows, an apparent and increasing ineffectiveness of monetary policy instruments, uncertainty about the Euro, Brexit, upcoming trade protectionism trends in the US, people turn again to precious metals. As such it is no surprise that yet again Degussa reported a 20 per cent increase in sales in 2016 compared to the previous year. Although the current Degussa company is not connected in a direct corporate line, the brand itself is the name you think of when it comes to buying physical gold. The Degussa brand and their slogans like “Gold’s value is enduring” or “Gold is timeless” have this specific effect on people offering a way to protection and comfort. And yes, it is true that gold has this tangibility that provides a feeling of safety. It is considered a safe haven, a value protector and there are many who advise to at least hold some of your portfolio in physical gold. But at times it seems the historic experiences of hyperinflation have burned too deep into the German consciousness. “German Angst” is an established term for a reason… And yet the surge in gold demand is not purely a German phenomenon. According to the World Gold Council, global demand more than doubled from 430t in 2006 to 1,051t in 2015. While some of the increase results from opening of new markets (China legalized private gold consumption in 2004), the main impacts can be explained through the financial crisis in 2008, the successive euro area sovereign crisis in 2012, following by more recent political events leading to an increase of the Global Economic Policy Uncertainty Index by 500 per cent in the last 10 years. To cut it short, people are scared and lose their trust in governments and fiat currencies. Well this explains all the demand for gold and while I don’t want to question the insurance effect of gold in times of economic uncertainty, one must ask: Does it make sense from an investors’ perspective to acquire physical gold or not? Warren Buffett: “What motivates most gold purchasers is their belief that the ranks of the fearful will grow. During the past decade that belief has proved correct. Beyond that, the rising price has on its own generated additional buying enthusiasm, attracting purchasers who see the rise as validating an investment thesis. As ‘bandwagon’ investors join any party, they create their own truth – for a while.” The quick answer is: It does not. At least not from a value investing perspective. Insurance effect aside, gold itself doesn’t produce any value and can therefore not be seen as a viable long-term investment. The price developments of the last decade were mainly driven by unforeseen events. As a speculator, you might have made some good returns, but for an investor, gold does not generate anything in terms of income. Warren Buffett: “The problem with commodities is that you are betting on what someone else would pay for them in six months. The commodity itself isn’t going to do anything for you….it is an entirely different game to buy a lump of something and hope that somebody else pays you more for that lump two years from now than it is to buy something that you expect to produce income for you over time.” If you do want gold as a crisis protection in your portfolio, I think the better approach is to invest a smaller part of your portfolio in solid, well-capitalized gold mining stocks. 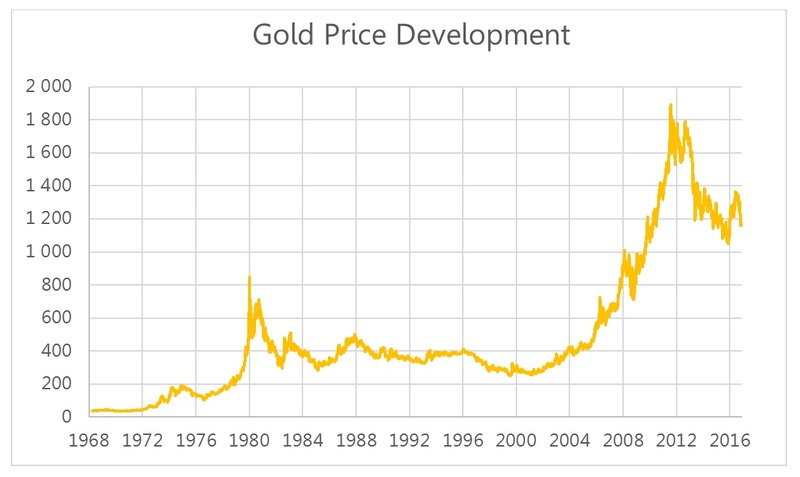 They make money on the exploration of gold, pay dividends and their value will increase even more when the gold price goes up, given their reserves in the ground. You can even diversify your risk and avoid single stocks if you invest into well-established senior gold mining ETFs. Take an example: While gold prices increased by 8.6 per cent in 2016, the Market Vectors Gold Miners ETF grew by 48.5 per cent in the same year. The explanation is simple. Let’s assume a company mines an ounce of gold at costs of 800 USD and the gold price is at 1200 USD per ounce. Then the profit is 400 USD. Once the gold price goes up to let’s say 1800 USD the profit increases to 1000 USD. So, while the gold price increased by 50 per cent, the profit grew by 150 per cent. To sum it up: I don’t think it is wise to jump on the physical gold train, not to mention to invest all your savings into one commodity. As a value investor, you should resist the speculative temptation. The insurance argument holds to some extent though, but if you do fear the end of the world, then single gold mining stocks or ETFs provide a better alternative.